Charles Trevor Lewis, 46, of Tollesboro, passed away Thursday morning, March 3, 2016, at his residence. He was born April 9, 1969, in Maysville, a son of Charles Marvin Knell and his companion, Sophie Fite, of Vanceburg, and Garnet Christine Flinders Knell of Vanceburg. Charles attended Evans Chapel Church and was a self-employed logger. He enjoyed fishing, camping, having cookouts, and spending time with family and friends. 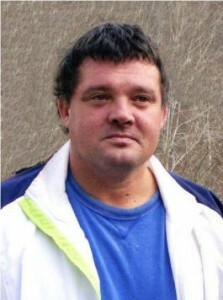 In addition to his parents, Charles is survived two sons, Cody Lewis and his companion, Courtney Cooper, of Tollesboro, and Trevor Lewis and his companion, Krystale Flannigan, of Portsmouth, Ohio; one granddaughter, Charlee Jane Lewis; one brother, Chris Lewis (Sydonna) of Tollesboro; four sisters, Sheila Lewis (Lowell) of Vanceburg, Lisa Hamm (Victor) of Maysville, Pam Knell (Estill) and Becky Mowery (Steve), all of Portsmouth, Ohio; and his companion of 16 years, Lillie Whisman of Tollesboro. He also leaves many other family members and friends who will sadly miss him. Services were Monday, March 7, 2016, at Dickerson Funeral Home in Vanceburg with Bro. Ronnie Hall officiating. Burial was in Ball Pointe Cemetery on Laurel Road. Family and friendsserved as pallbearers.